Click on the photo of Mommy Simplicity by Sandy Kreps to purchase the book on Amazon or add it to your wish list. Life is complicated. Especially if you’re a mom. You have so much to deal with: not just your own stuff, but everyone else’s stuff. And by “stuff,” I don’t just mean physical things like clothes, phones, homework papers and Teddy Bears. I also mean “stuff” like doctor appointments, homework assignments, social security numbers, the password for the WiFi router, and tasks like laundry, cleaning out the fridge, deciding what’s for dinner, making dinner, dropping off the dry-cleaning, picking up the dry-cleaning, making sure you don’t run out of dog food. You get the idea. Just thinking about how to simplify your life can be overwhelming. You soon start wishing for a man with a British accent to arrive in a blue Police phone box and take you away from your chaotic life. You want a simpler life, but where do you start? 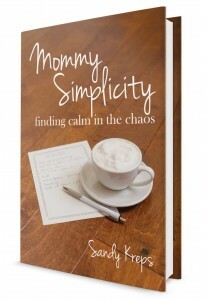 Mommy Simplicity by Sandy Kreps is a good place to start. This book is chock-full of practical ways to simplify your life. You can read straight through the 160-plus pages, or you can use the table of contents to find the section you need most right now: time management, “stuff” (in this case she does mean physical things), household management, and managing your kids’ lives. She includes 50 tips just on the one topic of how to simplify grocery shopping — that should give you an idea of how many good ideas there are in this book. While you’re reading the table of contents, you might notice a familiar name there. 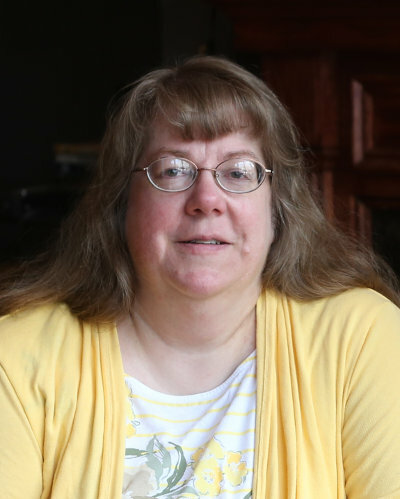 It was my privilege to share a testimonial and also, in another chapter, Sandy included a tip I shared about my somewhat unorthodox laundry system. I absolutely hate laundry, and two things I despise are piles of laundry (dirty or clean-but-in-need-of-folding), and having to do loads and loads of laundry on the same day. I’ve worked out a method so I rarely do more than one load in any given day and you will never find a pile of dirty or clean, unfolded laundry in my house. You’ll just have to read the book to discover my secret. The household management section includes budgets, meal planning, grocery shopping, 2 full chapters on paperwork, and tips for working moms. The section on the kids includes toys, school, routines, homework, artwork, calendars and schedules, sibling rivalry, life skills, holidays, and keeping your car organized and clean. Another great thing about this books is that it’s not one of those books you read and as you read, you discover that you’re feeling more overwhelmed. You realize that the author has her “stuff” together in a way that you will never be able to match, and you feel more disorganized that you did when you opened the book. Sandy makes it clear she’s in the trenches with us, her fellow moms, and she not only shares ideas but she has her priorities straight. She encourages us to know why we are striving to simplify our lives, so we’re not just simplifying for simplicity’s sake. She also talks about the importance of “me-time” so we don’t experience mommy-burnout. She reminds us of the tools we’ve been given that will help us be better moms. And she shares words of wisdom from other moms, so it’s not just a one-woman show. You can check out Sandy’s website, Modern Simplicity, or click on the picture of the book to order it on Amazon. Note: I was given a digital copy in advance of the publication date so I could write this review. My opinions are my own.